Unfortunately, the world is full of ignorant, disturbed and stupid people (all different things). Also very unfortunately if you take the New York subway, you are bound to meet all three kinds fairly regularly. And sometimes you hit the jackpot and meet someone who possesses all three of those attributes at once. And I got lucky yesterday! As I was walking on the subway platform towards a train, some black man stared at me and said with smile and pleasure, “Heil Hitler!” I am usually lost for words on such occasions because, even though I have been using the subway daily for the past 11 years, I am just not prepared for unwarranted hostility. This time, however, my reaction was almost immediate. I looked at him, smiled back and said, “Idiot.” And I needed no proof for my theory - the guy did it for me. Because based on what I learned, Fuhrer had a special place in his heart for the black population of this planet, and that place was very close to the one held by Jews. How dumb/ignorant/disturbed does one have to be to not know that? But then again, he didn’t look like someone who paid attention to his history teacher. I went to a wedding this Thursday. It was one of my husband's old friends, who finally found his other half. I wish them happily ever after. During the main course I took my little one to the restroom, where a woman heard me speaking Russian to DD, and in turn started a conversation in Russian with me. Turned out she was from Baltimore; we had a few friends in common. During the conversation this woman mentioned that Baltimore has a lot of available guys, and she wanted to know if I knew any single girls. I had a few names ready, and we were going through the regular questions: age, ever been married, where from, appearance. The last question inevitably led to the discussion of weight, at which point this woman sighed and said, "Guys nowadays only want thin girls." No kidding, I think I can write a book on the topic that could rival War and Peace in its length. (Don't worry, this post will not be that long.) At least this woman was nice about it and actually sided with us, pleasantly plumped female population. This brought me back to about five years ago, when I myself made a call to some matchmaker, who was recommended to me by an older acquaintance from the synagogue. After a short introduction and a few questions, I was asked about my weight and was told that girls over size 8 needed not apply for her services. That included me. In a few very short words I was rendered unmarriageable and hopeless. In five short minutes my spirit was crushed without much consideration. There was no sympathy, apology or compassion in her voice. You are fat, you deserve to stay single. Sometimes I think that a convicted murdered would have received more support from this woman. After that conversation, I immediately called back my acquaintance, and very indignantly recounted what had happened. I was in for another shock. My acquaintance told me, "Call her back. Tell her you are size 8." "But won't she notice that I am not?" I asked. I got an exasperated, "Then you should get to size 8!" I expected more understanding, especially from someone whose own daughter struggled with weight. But then again, due to a medical condition my acquaintance never was an ounce over size zero, so she would never, ever understand what it felt like to be told to lose six dress sizes in two weeks, especially when you tried for the past two years. She would never, ever know how insulting it was to have had your personal worth measured in pounds and dress sizes. For the first time in my life I was grateful to come from a family of full-bodied women; I might have gotten a fat gene or a lifetime of bad eating habits, but I also had my mother's understanding in this area. Somehow, I think that the daughter of my acquaintance was sorely lacking it. Now, after getting married, I got my own window into the male psyche. I once broached this subject with my hubby, and received a confirmation to my long held belief. There truly are men who cannot be attracted to a woman over a certain size. And there are others, greater in number than the first group, who might not personally object to the looks of someone size 12. However, they are concerned about their friends' opinions. Since thinness is "in", having a fiancee or wife over a certain size is a sign that they have settled for someone sub-par. But back to the guy who got married on Thursday. He was looking to get married close to ten years. He had his list, and would not consider compromising. I don't know at which point be broke down, but the girl he married is definitely someone he would never consider dating only three years ago. No, the girl was not overweight, but that's not the point. He finally got over the fear of what some people might say, and now found someone with whom he wants to spend the rest of his life. So there are happy endings, and I hope that all my friends get their own happy endings too. When my husband came home and I heard the story from his side ( hubs, who was witnessing all these, "You are NOT Isaac?" bits of conversation and already having some mild fun, finally did get a chance to dial the number for the poor fellow. He then realized that the fellow was talking to yours truly, and at that point almost fell off a chair with laughter. In front of many, many people. Hubs did the same at home when he heard my side of the story.) No matter how funny it sounds, there's something unsettling when your flirty voice sounds like that of a Chassidic man from Boro Park. I don't think I would be able to get through this with my self-esteem intact without my husband's compassion - because there's no substitute for a loving man's comfort. My husband now walks around the house and keeps on repeating in a very low voice, "Hi dear." G-d bless his soul. He finally figured out what kind of comfort his wife needs. Ok, it was good while it lasted. Previously on this blog: My co-worker lent me her ID so that I would be able to catch up with my workload on the week-end. She was even nice enough to drop it off at my house. In this issue: Petrified that I would lose/damage/forget somewhere her ID, I kept an eye on it at all times. Whatever the circumstances, I was determined not to seem ungrateful or reckless with her property. I had to return the ID, nice and whole, before the end of the weekend. I had remembered about seven times during the course of Monday to call my co-worker and find out what her plans were, so that I could come to her house and drop it off. I got distracted for the total of seven times as well. I had very good reasons and excuses: I had a cold, my husband had a very bad cold, the kids were tired and misbehaving…. Long story short: Monday night around 12.15 am I realized that I was still in the possession of the ID and with no way to deliver it to my colleague. Nice… It really isn’t like me. I am disorganized, but with certain issues I am very, very determined and reliable. Well, I can’t say that any more, can I? So my poor generous co-worker got the bad end of Murphy’s Law this time. For going out of her way to be nice to me, she had to rely on the kindness of strangers to let her into our office. This stupid law probably rubbed off me. Serves her right for keeping me company. After posting so many times about Murphy's Law, I feel obligated to report something opposite and positive, the un-Murphy's Law. What would be the opposite of Murphy? I thought Rabinowitz fits well, but if you have any better suggestions, they are mostly welcome. I haven't posted much, actually anything in the past week, mostly because we are closing the year. Those who are not accountants will not understand, and G-d bless you! A lot of work means that I do not get to take lunch and have to leave office late, which leaves a lot of errands to be done at home and very few brains cells left over for anything remotely interesting, let alone witty to share. (I think I gave myself a compliment here, oh well...) But a lot of stuff has been and still going on. Crazy people on the train, demanding bosses, few interesting daydreaming sessions, rib mystery, Blog for Choice Day - just to name a few! There's so much that wants to be said and typed, but so little time is available. How is it all related to Rabinowitz's Law? Let me explain. Since there's a lot of work and the boss is demanding, the workload literally doubled if not more this month, and to add insult to injury, needed to be done in half the time. I am not kidding or exaggerating this time. Some people have managed to get it done (I suppose they don't have blogs, hehe), I was behind with mine. (Honestly, my work is very different from many people in the department, so there really are objective reasons for lagging behind other than pure laziness, and you saw, I didn't post much!) And the vultures, I mean auditors are coming very, very soon. All of this meant that I had to come in to work on the weekend. Luckily I had a choice between today and Monday. Unluckily, my ID/entry card doesn't work on the weekends, and I don't know whether it works on MLK Day. (It would also be nice to find it, but I am afraid it shared the destiny of my silverware and is now somewhere deep in my heater.) So I had to borrow my former boss' ID, whose access is not limited to normal working hours. Bad thing: it occurred to me that I needed her card five minutes after she left for the week. Good thing: she lives five minutes away from me (by car). It was decided that I would drop by and pick up the ID Saturday night. Friday night my husband gets sick, and Saturday night he is still so sick that he refuses to drive. It is very cold, and my colleague's house is at least half hour away by foot. It is also very cold and dark. I call her on the phone to see what her plans are, mentally ready to make a very unpleasant trip, most likely with kids so that they wouldn't bother sick hubby. She is not home and does not pick up her cell phone. Great, I think. According to Murphy's Law, she is probably two blocks away from me picking up her kids from a sleepover, but doesn't know that I can't get to her. And even if she does call me, she probably doesn't have the ID on her. And in either case, I couldn't ask her to drive to me because after all she is nice enough to share her ID, asking her to deliver it to me would be just pure chutzpa. And then - ta-da! Rabinowitz's Law at work. She calls me herself, and she indeed is not two, but about five blocks away, with her purse and ID, offering to drive to my house and drop off her card! How's that? I was besides myself with joy and relief. I love you, my former boss! And I love you, Mr. Rabinowitz, even though you are a product of my sick imagination. P.S. one might say that going to work on the weekend is really an off-shoot of Murphy's Law, and some day I might agree, but for now shhhh. Let me enjoy Rabinowitz before Murphy comes back full force. Here's the update on the Dimarsky family situation and the answer to the question, "What can I do?" I received this email from a woman close to the family. This is an excruciating time for the Dimarsky family. Needless to say that Sherry's untimely passing is a true devastation for them, and everyone who knew her. This is also the time when our generous donations can really help the people who have given their whole lives to others. We can help Rabbi Dimarsky and the four boys deal with their large medical and funeral expenses and help get them through these financially-difficult times. Let's show them that they are not alone in their trouble. May our charity elevate the holy soul of Sherry (Sara Chana bas Naftali) even higher. Last week was a difficult one for me personally and I think for a lot of my friends, people in my community and Jews in general. I will not dwell on the obvious reasons for sadness in my community; my previous posts explain it all and at the same time only barely touch the surface of sadness and the feeling of tremendous loss. This post deals only with my experiences and feelings. So here's my week in review. My great-aunt's husband passed away on Thursday, my grandmother was hospitalized with - guess what? 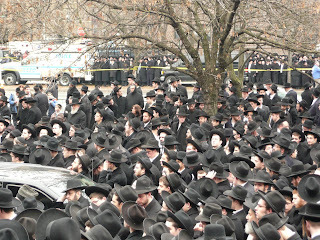 - her first vertigo on Saturday, Rabbi Berenbaum passed away on Sunday, and on Monday I found out about Mrs. Dimarsky. This loss was the hardest to bear, still is. It was more personal. It was unexpected. It didn't seem right or fair. It raised a lot of questions, some more appropriate than others: why her? why now? what's next? what can I do? how can I help? Right before I found out about Rabbi Berenbaum's death, I had completed a funny post. It didn't seem appropriate to post it then. It still doesn't seem appropriate to post it. It will have to stay in the draft form a bit longer. I was thinking of writing something about Sherry, but couldn't find the right words. For the first time in a very long time I don't want to be funny. Right now I just want to be sad, to ponder on the questions in my head, to think of the things that I can do to honor the memories of Rabbi Berenbaum and Sherry Dimarsky. And maybe reflect on why my week was surrounded by three deaths. Is this a message? A wake-up call? Or a simple reminder that I don't have all the time in the world? Her soul was too holy for this world and she is breathing much easier now. It's just devastating for the family and us. There is something that we can do for the family and I will G-d willing send out info later tonight when I get it. For now, they have a message board at http://dimarsky.com/sherry.html and you can leave your words for the family there. I am sure they will really appreciate it when they see it. There's also a beautiful tribute written by Sally Hazel on her blog, here's the link. 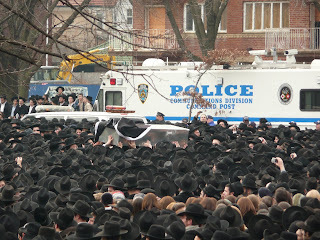 This is the casket with the Rav's body. People walked with it for quite a few blocks, and then it was taken to JFK to be buried in Israel. Many people came from upstate New York, New Jersey and different boroughs of New York. Many came by buses (you can see them in the background). 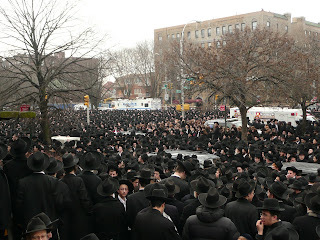 My husband said that it was extremely hard to ride a car that time of the day because both Coney Island Ave. and Ocean Parkway were full of buses and cars all coming for the funeral. There were so many cars that there was no parking in the 10 block radius. 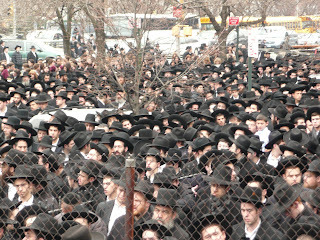 Many people spoke about the Rav's many deeds of loving-kindness and dedication to G-d, Torah and commandments. I saw that many people visited my blog in the past few days. My best guess is that they were looking for the news and articles about the Rav. I am sorry to disappoint all of you. I hope that these pictures will serve as at least some consolation for the time it took you to come to this site. It is with the greatest pain and sorrow that I am writing of the untimely passing of our dear friend Sherry Dimarsky, Sarah Chanah bas Naftoli. With her bright light gone, this world will be a darker and a colder place. No words can describe our loss. The funeral arrangements are not yet made, but it will take place some time tomorrow. May G-d comfort her husband, boys, parents and brother among all of the mourners of Israel. I couldn't have put this better myself. I can't write any more because I don't see the screen through tears. I just got this in my email. I personally saw Sherry only once in my life, but she made a huge impact on me. She also remembers me to this day insisting to keep in touch. She is always on a look-out for a mitzva and seeks out ways to help, even to people she only saw once (this is from my personal experience.) I plead with all of you visiting this blog to get news about Rav Berenbaum to please say a prayer for this absolutely wonderful woman. As you may or may not know, Rabbi Dimarsky's wife, Sherry, is critically ill. The lung that was transplanted 3 years ago is being rejected and the doctors give her a week (!!!! May we never know the horror of such statement !!!!) when she can still qualify for another lung transplant if a match is found. They are estimating that after that she will be too weak to go through such major surgery, which is the last chance, at least in our human view, for continuing to live a normal life. Aside being a mother of 4 wonderful boys and a wife, Sherry is the most giving and community-service dedicated person I know. Being a lawyer, she chose a non-financially lucrative career and for many years headed an organization for abused women, giving it endless hours and her physical and mental efforts. Even while being very ill, Sherry spent all of her time helping, mentoring and comforting others. I and hundreds of others have been inspired and touched by her light. What she and her husband did for the Russian-Jewish community of Chicago is immeasurable and seems hardly humanly possible. Sherry's parents are both Holocaust survivors who have already buried 2 out of 4 of their children. We can't even imagine what they must be going through at their old age with their 3rd and youngest child being so ill.
With that being said, we believe that the power of prayer can change a situation even as grave as this. We are asking everyone to say prayers as much as you can for Sherry's miraculous and speedy(!!!) salvation from her suffering and that of her family. When we pray for an ill person, we use their Hebrew name ( Sarah Hannah bas Bayla). Prayer doesn't have to be formal - sincere words coming from the heart are just as powerful. Also, we are asking that people dedicate (mentally) mitzvahs-good deeds- to Sherry's salvation. It can be something simple that you are not doing otherwise (i.e. lighting of Shabbos candles, Torah lessons, giving charity, choosing not to engage in gossip, etc.) Please do something special this week. May all of our communal prayers and good deeds break the evil decree! Thanks in advance for all of your help. P.S. Please pass this on to anyone who might know the Dimarskys and is not aware of the severity of Sherry's current situation. I just heard this from my husband. Rav Raphael Shmuel Berenbaum, zt'l, had passed away today. The Jewish world had lost one of the greatest sages of our time. My husband said he had never seen so many grown men cry. Update: The levayah will be held at Mirrer Yeshiva starting 8.45 am until about 11 am, and then the body will be flown to Eretz Yisrael for burial. Only a few days prior, the entire incident would barely register in my head. I would just nod in all the right places and do whatever seemed right at the moment. But not now. Now I was educated (i.e.completed two out of six parenting classes on a CD only last night), and my educational sources said that No should be No. Backtracking your No is big no-no. Even if made by another parent. Even if made in haste (another parenting no-n0). Even if you don't agree and weren't consulted. Even if you will ultimately pay the price of that No because the big genius and decision maker will be gone to his night class and you will be putting the kid to sleep, the kid who didn't spend a single night of her life without her pacifier. Getting kids ready to sleep was hard and heartbreaking. My daughter wouldn't cry, she actually figured out that she lost her pacie because of crying, so every so often she would come and say, "Mommy, you see I am not crying, could you please give me my pacie?" But I had to be tough, and I was. I no longer had the freedom to do what seemed right at the moment because now I was educated. Giving in now meant behavior problems/neuroses/life of crime later. I actually started making peace with the situation; sooner or later this had to happen since there was no way DD would give up pacie on her own. Putting the kids to sleep was even harder. DD simply would not fall asleep without her dear pacie, but would lie in bed and quietly cry. Somehow she would also wake up her brother who all of a sudden discovered an overdeveloped sense of compassion. After about an hour I gave up and told the kids that their father would put them to sleep. At least I wasn't giving in and stood my ground in the Great Battle of Pacifier. Then the decision maker came home. A smile, a hug, a kiss, a strategically well-placed single tear in those big gray eyes, and a solemn promise to never, ever cry about her pacifier again - within five minutes of hubby walking in the door DD got her pacifier back. _________!!!!!! Yes, you got that right. I suffered for two hours, and he gave in almost immediately. To my, "But all the parenting specialists say..." I got, "Parenting education is great (how would you know, you never did any??? ), but sometimes you have to do what seems right at the moment."